I've been listening to a lot of blues lately which is hard to write about - it's been around awhile and it basically had it's heydey about 50 years ago. I'm very suspicious of any genre that inspired vapid British arena rock played by white guys with big hair and loud guitars. It's funny how basically the most humble of all music was the direct cause of so much dumb classic rock. There's an interesting parallel here: folk and blues in the 1960's is basically equivalent to rap/hip hop in the 2000's. Think about it. Blues basically sprouted out of black peoples' horrible existence as the dirt poor of the south. Hip hop started from the ghettos in big cities across the country. They both were eventually co-opted by big labels into a money making machine designed to sell records to white high schoolers. In very few instances do the modern versions represent anything close to the original intent - less feeling, more capitalism. But I digress. 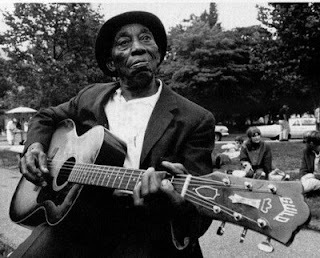 Everything I know about Mississippi John Hurt comes from his Wikipedia page but I'll summarize it here: he was a sharecropper his whole life and recorded like one song in the 1920s. The depression hit and he went back to farming for awhile. In 1963 some random white guy found one of his old records, tracked him down and convinced him to start recording again. He had some success in the "American Folk Revival" until he died a couple years later. He's basically the man when it comes to great fingerstyle guitar and I'll just stop writing and post some music.